You can see the report about CSR in PDF form. By promoting the following CSR activities with the recognition of Business Activities equal to CSR, we aim to realize the Sustainable Growth of the Company and Society, while giving due consideration to various stakeholders. For us, CSR, which should be implemented by the company, is not only compliance, internal control, risk management and information disclosure but also sound business activities, provision of proper services to our customers, improvement of employees' working environment, environmental conservation activities, and social action programs. Actively conduct blood donation activities in response to the Japanese Red Cross Society's Blood Program. 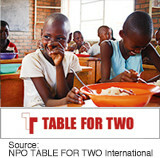 We promote "the CUP FOR TWO" Program in support of the activities of TABLE FOR TWO International, a non-profit organization. Support member of The Eye Mate Inc.
As part of our mecenat activities (to provide support for arts and cultural activities), we sponsor the Japan Philharmonic Orchestra". Conducted cleaning activities in the area surrounding our Head Office building in Ebisu. Participated in the e-Net Caravan activity that supports the secure and safe internet activities of children.